Custom gauges were fabricated to appear stock - almost! Notice the 160 MPH Speedometer and the modern quad gauge. These are all electronic packages that retain the real flavor of the original equipment. 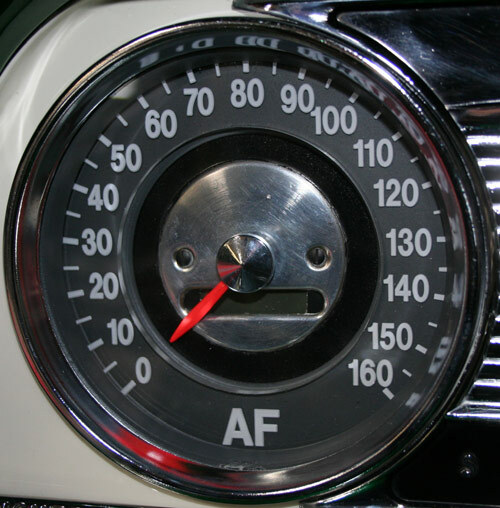 I challenge you to find any off-the-shelf gray- faced gauges anywhere. These gauges have been precisely instrumented to interoperate flawlessly with the LS1. Even an experienced '55 Buick Special aficionado will have to look twice at these fine instruments to realize that they are not stock. We didn't find these at Pep Boys. In case the car is lost in a crowded parking lot, I'll be able to tell which white-on-green '55 Buick is mine by inspecting the custom initials "AF" on the instrument cluster. Sometimes, the goofiest little touches can make a guy happy.